Click on the image below to open the image larger, after opening click again to 2 x enlarge and then scroll with your mouse’s thumb wheel while holding your “Ctrl” key in order to magnify the image larger or smaller, use your browser’s back arrow to return to this webpage. 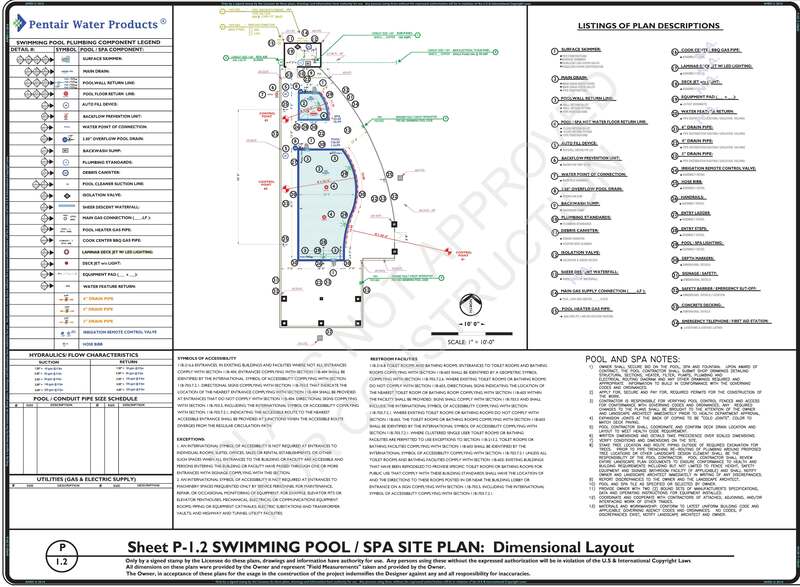 The plan below provides a preliminary layout diagram of the pool, spa, equipment room and safety barrier containment and exhibits plan listing items 1 thru 34. We have provided this as only an example of what is typically involved in meeting CBC Building Code compliance. 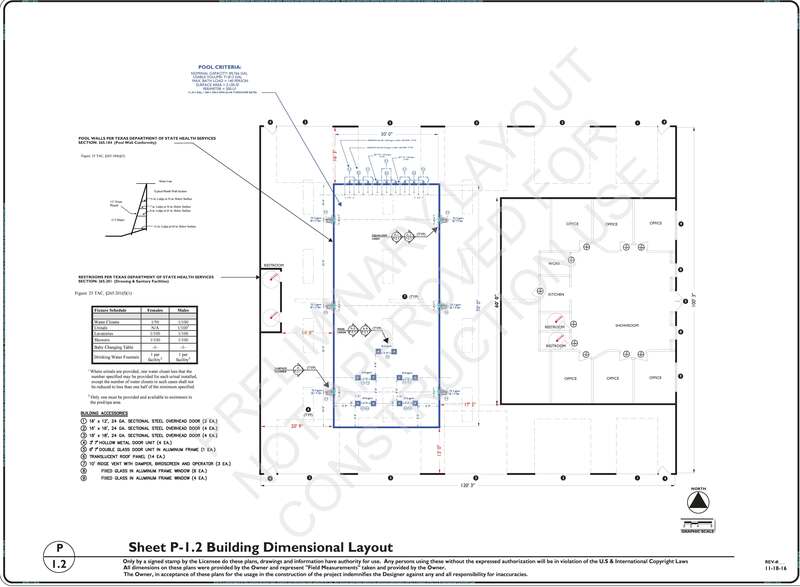 In making preparations for your permit submission, the required information must be exhibited on several plan sheets that will fully express “all” the code compliant construction intentions. 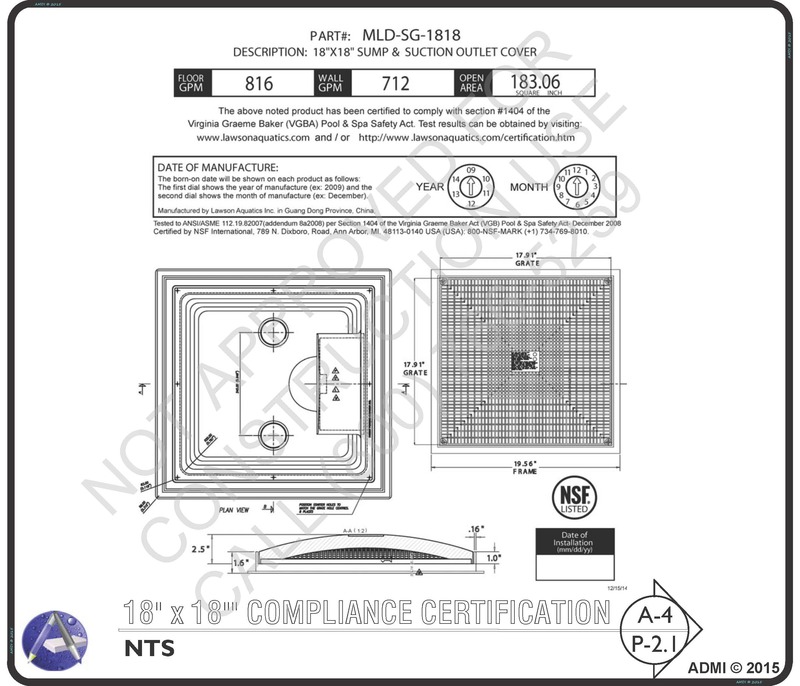 The Environmental Health Department’s (EHD) requirements for achieving the VGBA compliance for suction flow velocities, as well as the return turnover rate for proper public swimming pool filtration, mandates the use of grate covers that have acquired the anti-entrapment certifications from the ANSI, ASME, ASTM, NSF and NSPI. 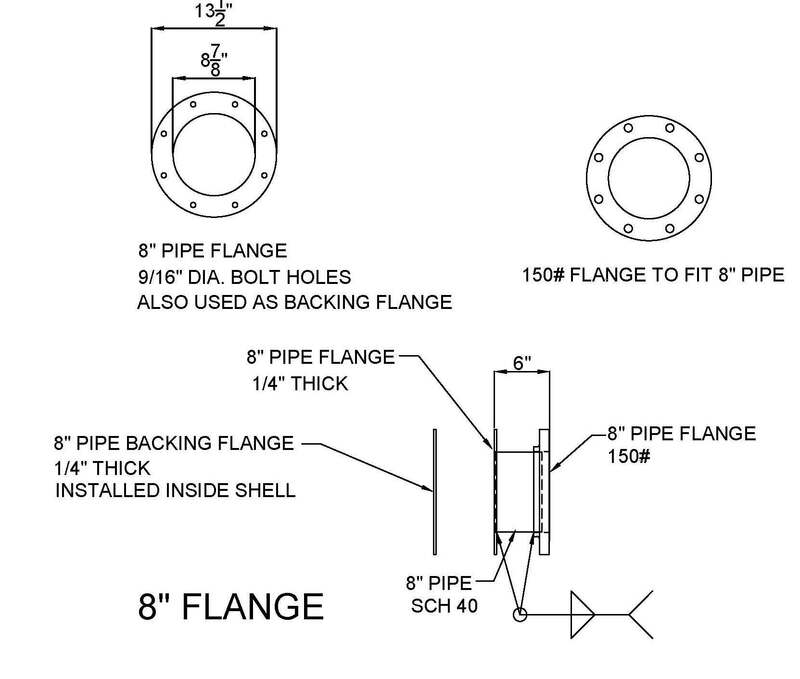 Therefore it would be best to employ the products that the EHD is most familuar with and that apply the formulas for the open space pipe sizing equations that are recognized as meeting the Virginia Graeme Baker Act (VGBA) nationally adopted guidelines. 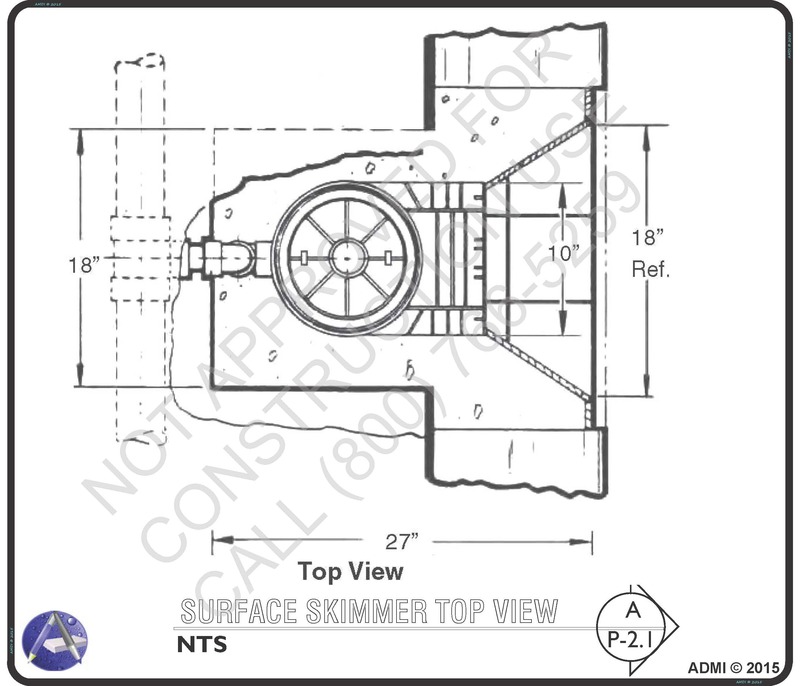 The above symbol is provided on plan as a reference point for the design elements that are being considered. These labels together with descriptions and arrows point to the locations that identify the specific components. The Design Sheets that are referenced as; Sheets P-1, P2, P3, P4, P5, P-6 and P-7 use these labels to direct you to the specific pages of reference that may become part of the advancing level of design, should you desire further clarifications. Permit Ready Plan i.e. Sheets P-1, P-3 & P-5 reflect what is necessary in submitting for a Building Permit. These are intended to exhibit the information that involves a typical Building Department’s critiques, in which they can identify the intentions for reaching compliance for the swimming pool building codes. The Public Swimming Pool approach must exhibit additional plan sheets i.e. 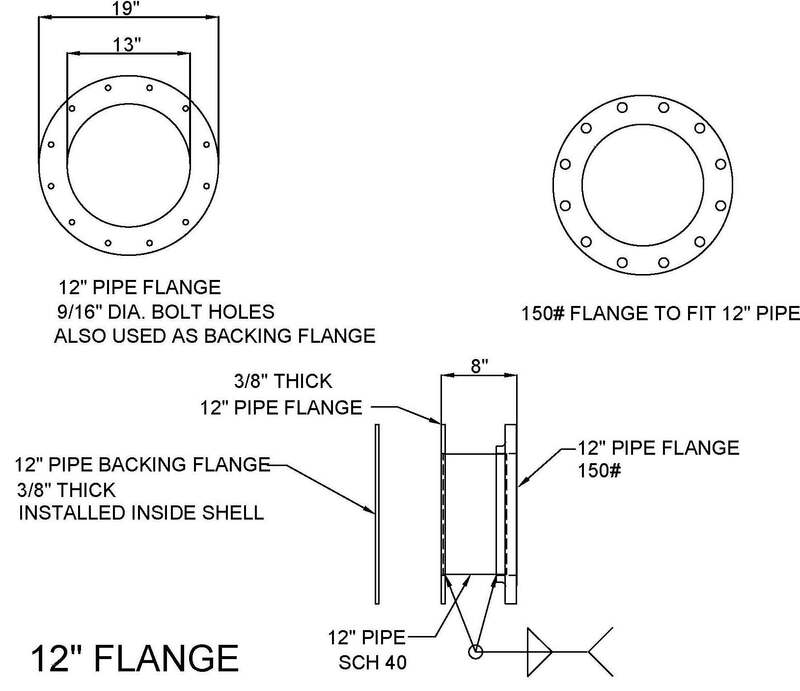 ; P-2.1a, P-2.2a and P-6.1, which provide a deeper understanding for the “mandated” installation requirements of pipes, conduits and equipment. 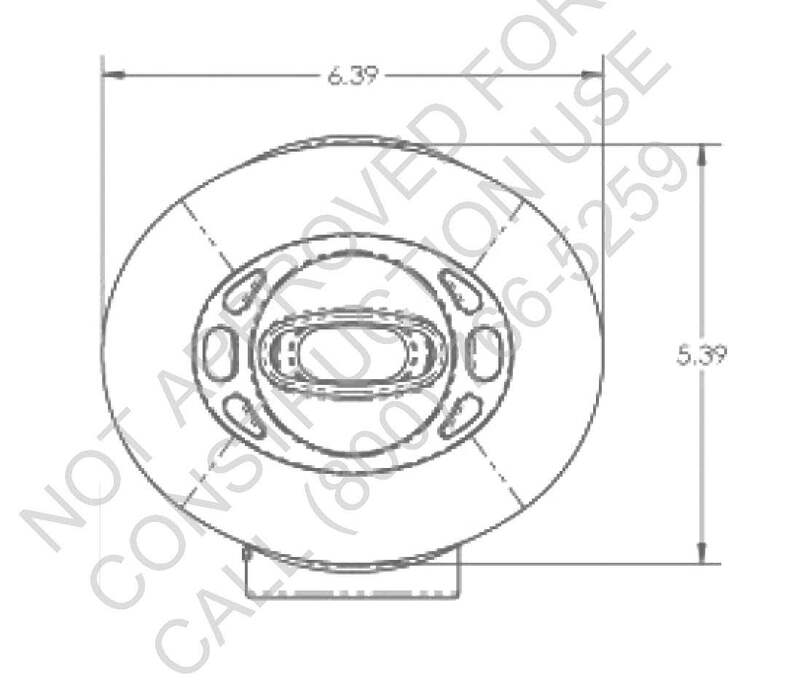 If any of the P-Sheets for specialty applications (prototypes) have not been included in the design quotation, then they may evolve as a new requirement as advancing stages of development unfold. In such cases a Design Addendum would be presented and agreed upon before progressing. 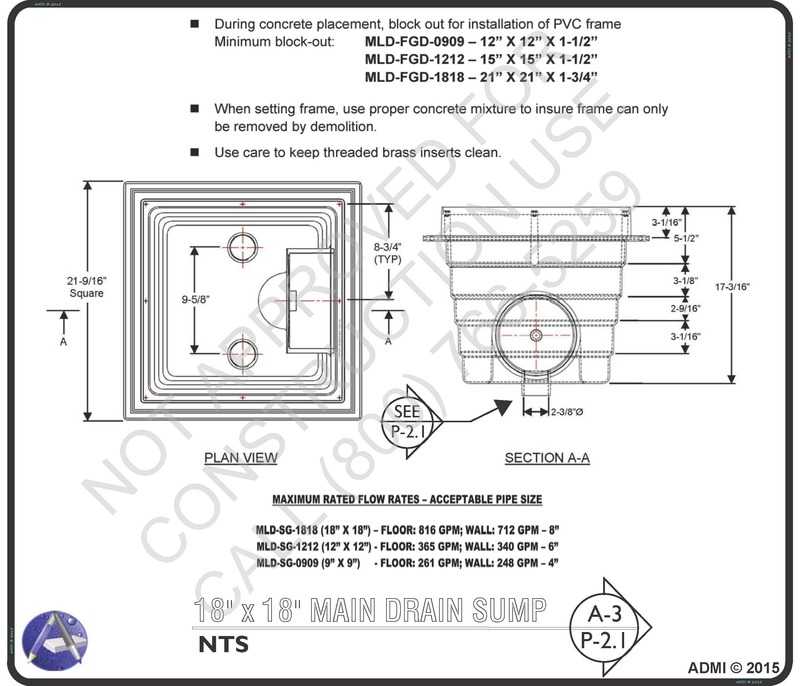 Standardized “Boiler Plate” individual “Details” shall be exhibited on Sheet P-2.1ba, 2.1c, 2.2b and 2.2c. If a Design Addendum is requested and accepted then we shall produce Custom Details that may become necessary in exhibiting a greater understanding for the individual components that are being employed in the further advancements of the design. We are a resource for information that can aid your journey in incorporating a regulation compliant swimming pool / spa standard into your project. In our design approach, we offer our clients a selection in that of the level of design that may be most appropriate for their needs. As that understanding may evolve and if a desire for exhibiting greater intensity becomes desired for the design intent, then we offer additional services that can facilitate a deeper meaning. The Tank’s dimensions provided on the preliminary building plan A-1 reflect a 2,100-SF surface area and a perimeter of 200-PF. 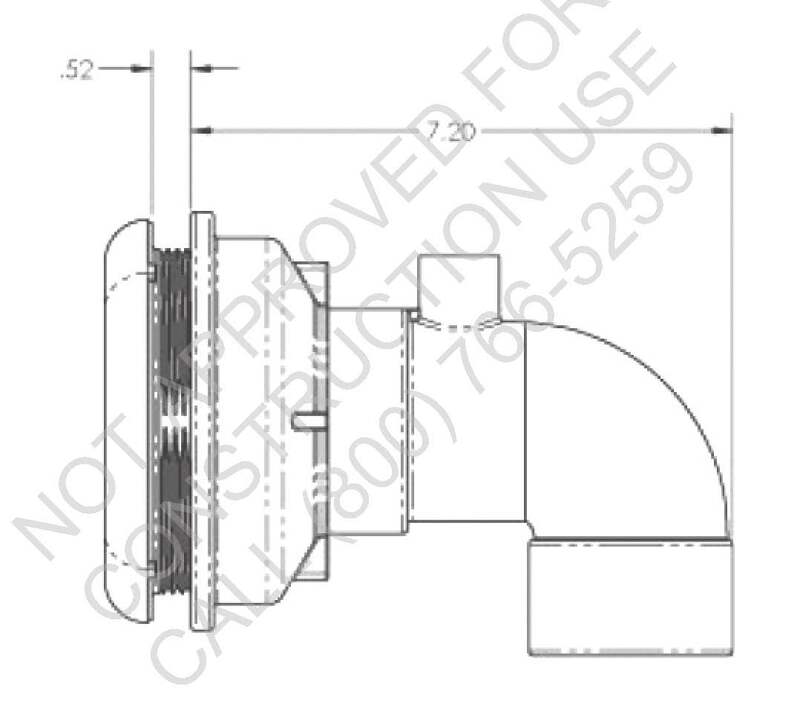 It’s rectangle shape is shown on the drawing as 30′-0″ I.D. 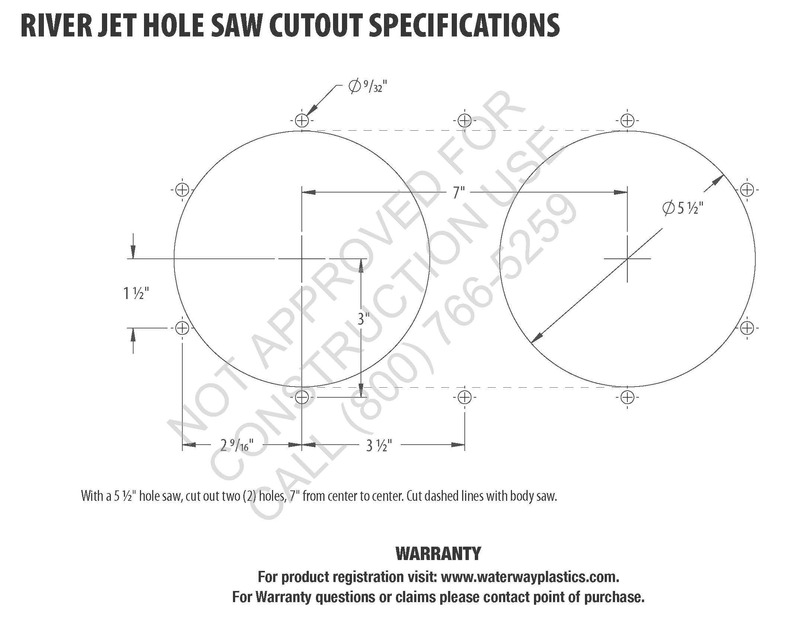 width and 70′-0″ I.D. length. We have been told that the bottom depth will range from -3′-6″ in the shallowest to 5′-0″ in the deepest part. 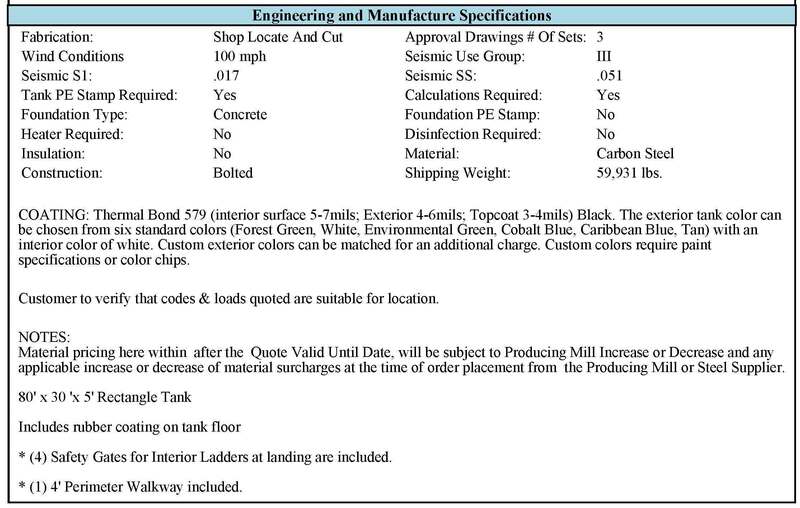 We will need a “Tank Section Detail” that exhibits the exact dimensional conformity, as the specifications listed on the proposal indicates 80′-0″ in length. 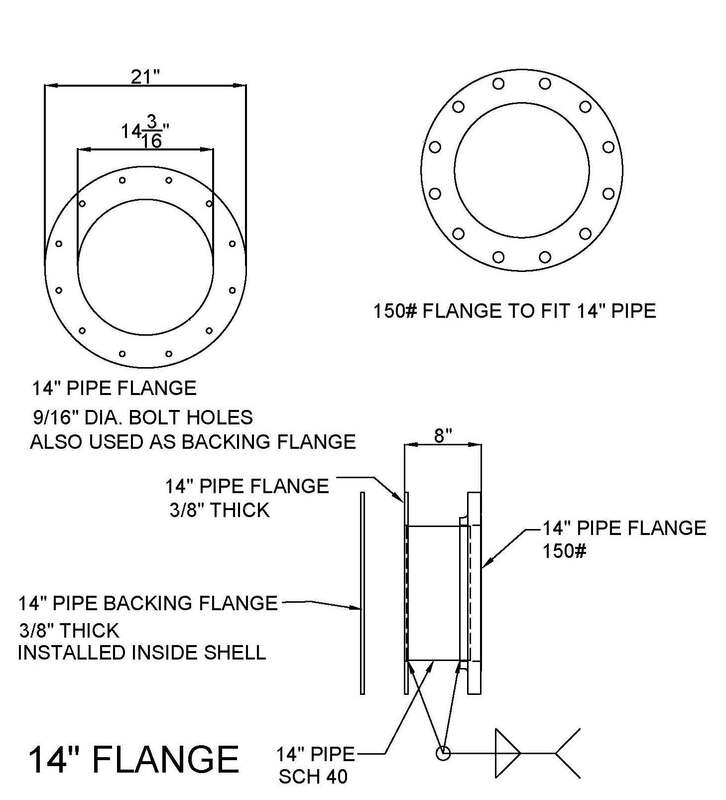 The Tank Specifications reflect 150-psi rated “Flange” connections that conform with 8″ (8), 12″ (11) and 14″ (4) dimensions, which are standard for water tanks. In providing for a Tank that will comply with the VGBA mandates the provisions for influent and effluent water will need modifications to these specification for achieving compliance with the public swimming pool codes. 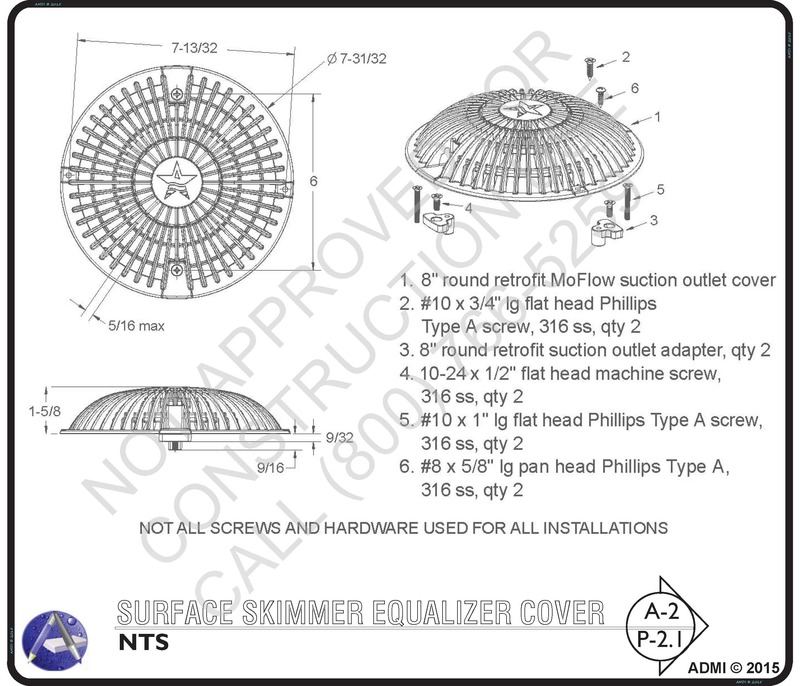 In providing for the suction and return water requirements, there shall be two (2) independent systems. 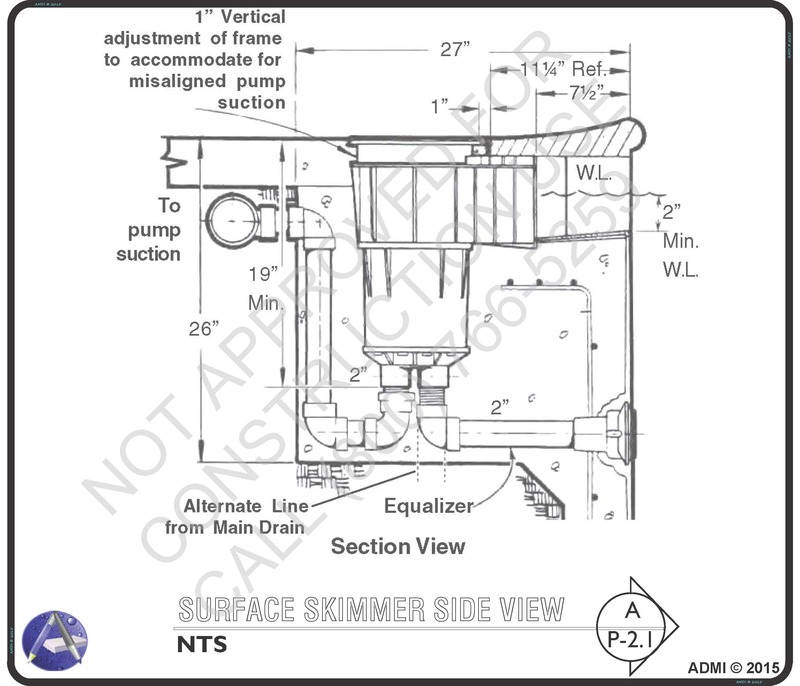 The first being that of the filtration water, which must meet the EHD turnover rate guidelines and the second being that of the multiple jet pump environment, which will need to meet the pipe sizing and maximum allowable velocity criteria for achieving the ANSI, ASME, ASTM, NSF and NSPI open grate space size and conformity. 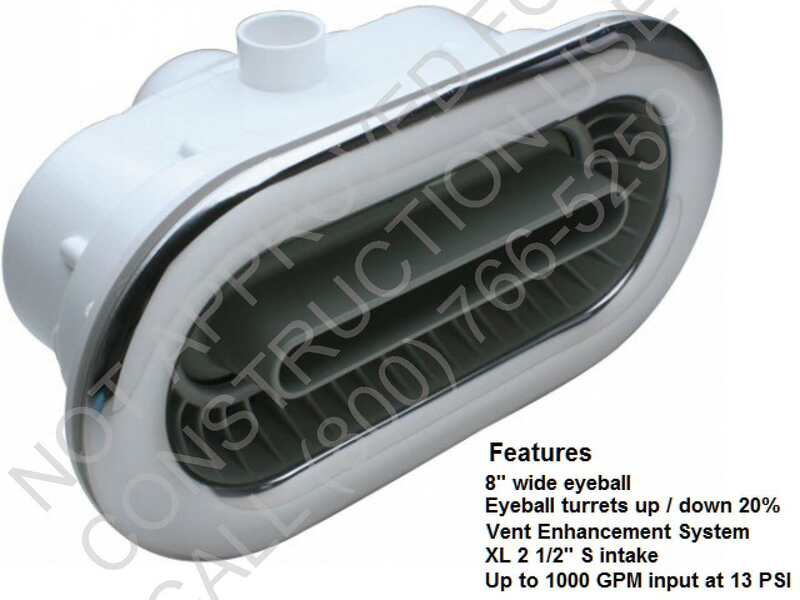 The Tank’s water volume and turnover rate shall be the determining factor for the FILTRATION flow rate and this will dictate the pipe sizing square inches of open grate space requirements for this specific pumping requirement. The Swift-water flow rate rate shall be determined in further discussions that can aid the establishment of fulfilling the anticipated water movement objectives for the artificial flowing current that is being contemplated. 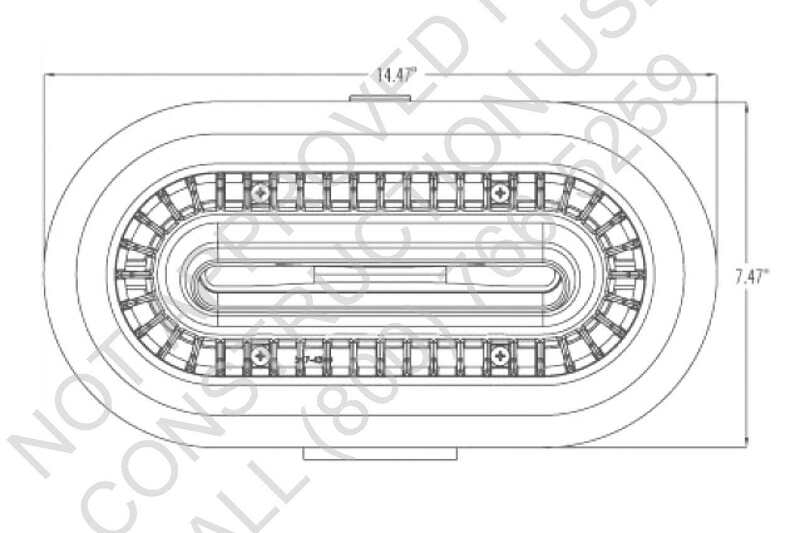 The Tank diagram below exhibits a preliminary layout (Sheet P-1.2 Building Dimensions) for our understanding thus far. It makes reference to SECTION: 265.184 11 deg. 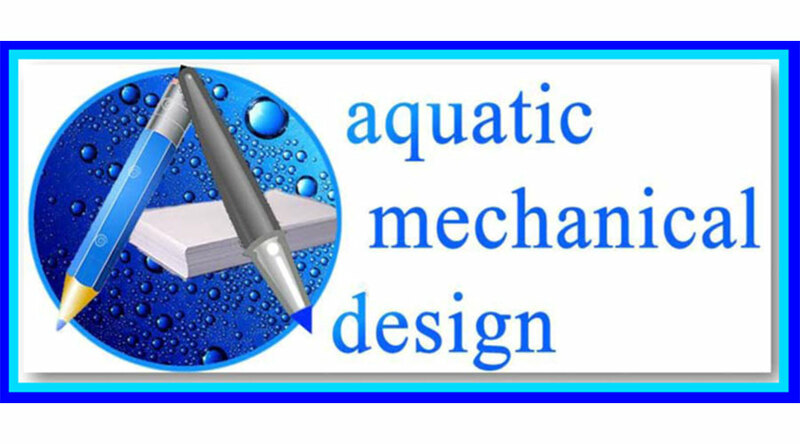 being a Pool Wall requirement that will likely pertain to the Tank Wall conformity. 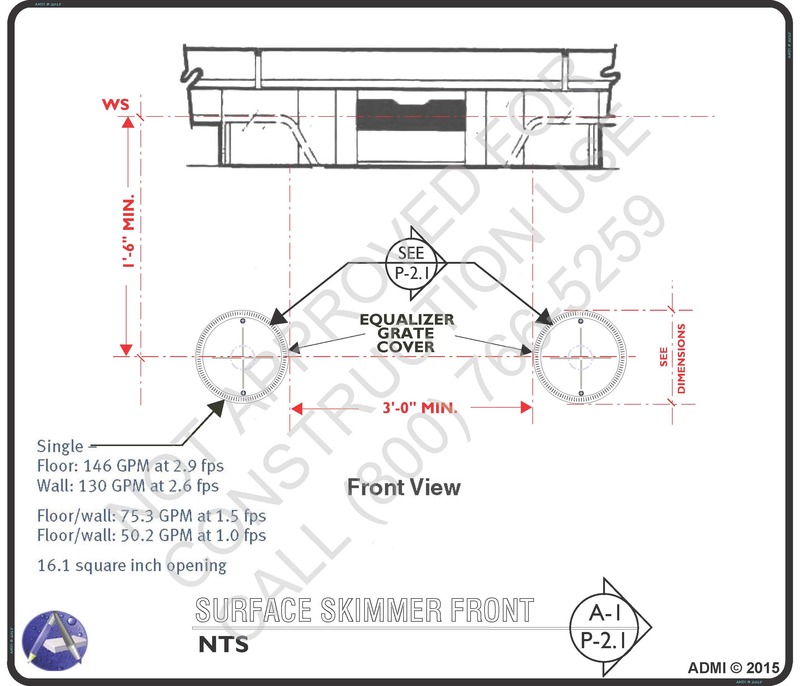 Additionally, the Bather Load determination is in relationship to the surface square footage and Tank depths as such information applies to the Public Swimming Pool Codes. This diagram also makes reference to SECTION: 265.201 (Dressing & Sanitary Facilities) that correspond to surface area as well. This preliminary plan exhibits a total of eight (8) Jet Pumps and one (1) Filtration Pump. There are a total of nine (9) Jet “B” style and ten (10) Jet “A” style Jets exhibited. The Jets are manifolded into equal groups of 3-Ea Jet “B” and 2-Ea Jet “A” assembly styles, which can offer a variable flow decrease and increase condition according to each pump’s Tank position and selected activation. Jet style “B” has a large diameter nozzle snout that is flow directed adjustable (@ 133.0 gpm), which can be directed to contribute underwater and or surface turbulence as desired by making the appropriate adjustments. 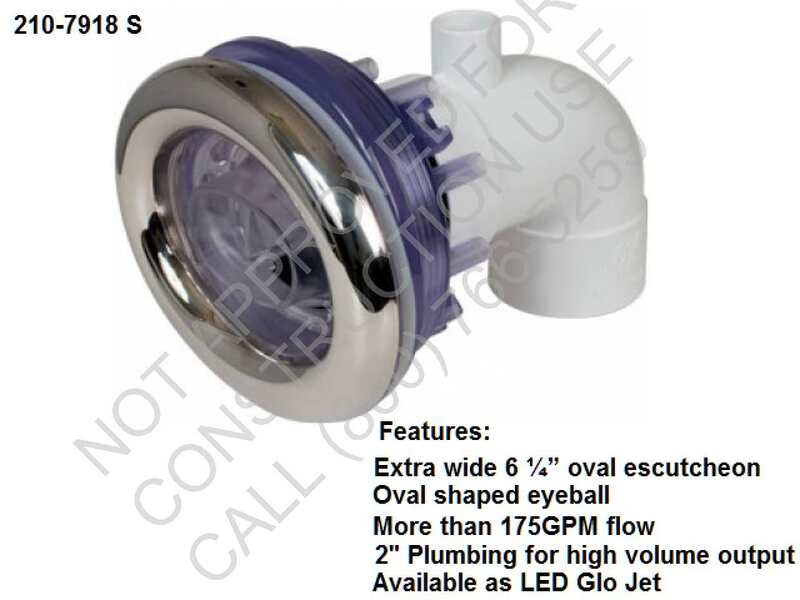 Jet style “A” has a wide flute nozzle snout, which is also up or down adjustable (+/-20 Deg. ), which can be directed to contribute underwater and or surface turbulence as desired by making adjustments. This Jet also has a slightly higher flow rate prescribed @ 200.0 gpm. 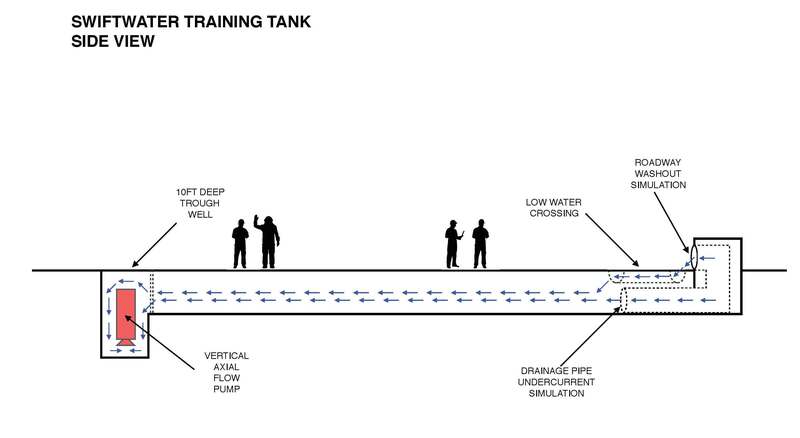 This is a preliminary approach to developing a plan and specification for imitating a Tank contained “Swift-Water” training environment with variations in control-ability, while conforming to the adopted Texas Health Code standards for Public Swimming Pools.